How do I know if I can retake a quiz? Some instructors will allow you to retake a quiz. The quiz will show you if you are allowed more attempts. Note: Your instructor may be using an upgraded quiz tool called Quizzes.Next in your course. If the quiz you are accessing displays an assignment icon instead of a quiz icon, your instructor is using Quizzes.Next. Functionality may differ between these quiz types. For help with retaking quizzes, please see How do I know if I can retake an assessment in Quizzes.Next? 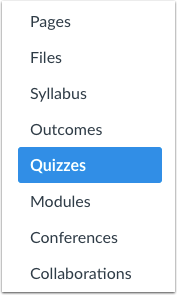 In Course Navigation, click the Quizzes link. Click the quiz title to open the quiz you want to retake. If you can retake the quiz, you will see Take the Quiz Again button. Click the button to retake the quiz. Contact your instructor if you have problems accessing the quiz. Note: You can see past attempts in your quiz results. Previous Topic:How do I view my assessment results as a student in Quizzes.Next? Next Topic:How do I know if I can retake an assessment in Quizzes.Next? Table of Contents > Quizzes > How do I know if I can retake a quiz?